Blue Medeci Cup - Triple Pack. These Blue Medeci Cups are part of the Medeci System Cup drinking range which has been developed to provide a range of interchangeable cups, handle and lids that can be used in a wide range of combinations to provide the solution to most users drinking requirements. The Blue Medeci Cups feature an array of vertical slots around their edge, into which one or two handles can be easily inserted, allowing the handle positions to be altered to suit the needs of the individual user. Two handles are supplied with each of the cups and where both are fitted, they can be placed close together or diametrically opposed. Once in place, the handles will remain securely fixed ensuring user safety whilst drinking. Optional extras for the cups include a clear lid and a lid with a drinking spout, both of which are sold separately in this section of our shop. 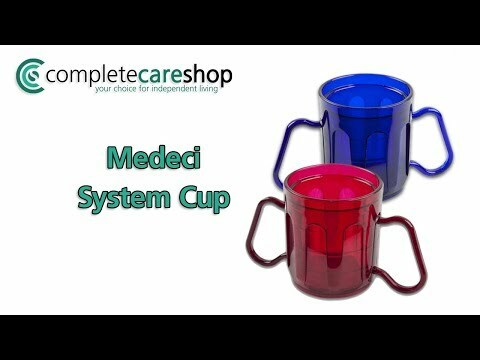 Medeci cups are available in a wide range of bright colours making them particularly suitable for those with visual impairment or those suffering from dementia.